Garden of the Gods is a rock garden in the island of Lanai noted for some unique geological rock formations that are colorful and hosts a variety of features that attract not just the geologist but also the nature tourist. The rock garden is located just past Kanepuu Preserve and boasts rocks that are scorched by ancient eruptions and carved by nature. The rock garden is located seven miles or eleven kilometers north of Lanai city and is also known as Keahikawelo. 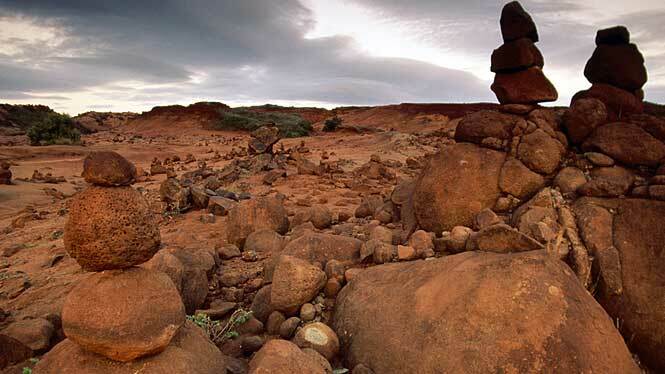 The presence of boulders and rock towers in various unique positions make it an other worldly place and one of the most beautiful spots in the island of Lanai. The boulders are in spectrum of red, orange, purple and earthen colors and the rock colors vary depending on the time of the day. Great sunrise and sunsets can also be observed in the area thanks to the rocks and the changing rock colors by light. From the far end of the garden one can look out to the Pacific Ocean and nearby islands of Molokai and Maui. The road leading to the garden is unpaved and one can spot native deer grazing in the grass besides the awe inspiring, wondrous visual beauty of the rock formations. Garden of the Gods image from aloha-hawaii.com.